For the first time since 2009, the biggest manufacturers of electronic devices spent more in total on wireless chips than on standard computer chips, according to a new report from IHS iSuppli. Device makers spent $58.6 billion on chips for wireless devices last year, compared to $53.7 billion spent during the same time period on chips for desktops and notebook PCs. It’s been two years since wireless chip spending last exceeded PC chip spending, but thanks to our obsession with smartphones and tablets, it’s unlikely that trend will reverse itself again. Spending on the two types of semiconductors was essentially a tie in 2010, when wireless chips totaled $51.2 billion and spending on PC chips was $51.8 billion, according to IHS iSuppli’s calculations. But the growth in 2011 was all wireless, as you can see in the chart below. 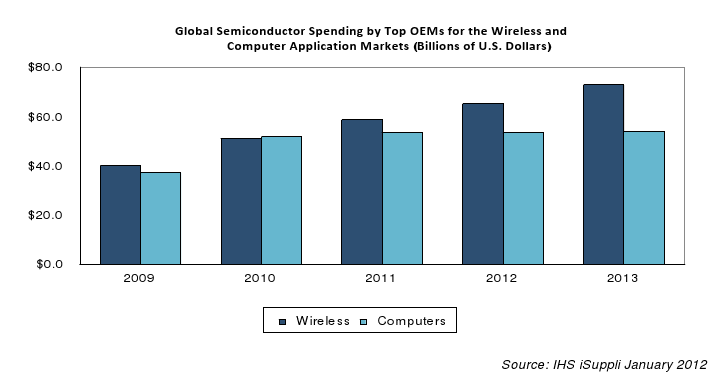 And who’s spending the most on semiconductors for tablets? You won’t be too surprised to find out it’s Apple(s AAPL), the world’s biggest seller of touchscreen tablets. Last year, Apple spent $4.6 billion on chips for tablets, more than any other OEM. The next closest — though “close” is a relative term here — was Apple frenemy-in-chief, Samsung, which spent $603.2 million on tablet chips. HTC was in third with $199.2 million.